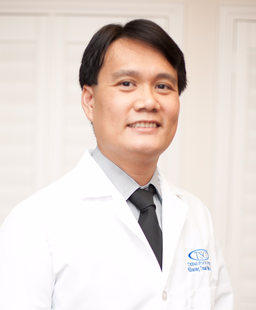 Dr. Khuong Dinh has been practicing optometry in Corpus Christi since 2001. He specializes in comprehensive eye exams, glasses and contact lens prescriptions, treatment of eye infections, foreign body removal, dry eyes, and computer vision syndrome. With a family history of nearsightedness, Dr. Dinh began wearing glasses in junior high. Always amazed at how greatly improved his vision was after leaving the optometrist's office, Dr. Dinh became interested in entering into the eye profession. Dr. Dinh graduated in 1997 with a Bachelor of Science in Biology at the University of Houston. He received a Doctorate of Optometry in 2001 from the University of Houston – College of Optometry. His residency training was completed at the Herman Eye Center affiliated with UT of Houston, concentrating on eye diseases and specializing in glaucoma and cataracts; and Hopping Eye Associates, focusing on comprehensive vision care. After 13 years in practice next to a national optical chain; Dr. Dinh decided to join the TSO network, an organization of doctor-owned and operated eyecare practices. In November 2014, he began the exciting adventure of opening Parkdale Texas State Optical, where he offers quality eyecare products and provides patient services with care. Dr. Dinh was born in Vietnam and moved to Houston at an early age. He has fond memories of growing up in Houston and regularly returns to visit family and dine out at great restaurants. He enjoys living in Corpus Christi due to its laid-back pace for families and an excellent growing economy. Dr. Dinh's wife, Dr. Diane Nhan, is also an optometrist and the proud owner of Texas State Optical on Saratoga Boulevard in Corpus Christi. They have one son, Kevin; and two dogs, Lucy and Cotton. In his free time; Dr. Dinh enjoys tinkering with his car, traveling with his family, eating great food, and riding bikes with Kevin.